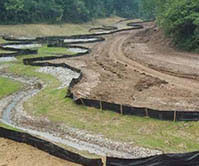 The purpose of a silt fence is to retain the soil on disturbed land, such as a construction site, until the project is complete. Keeping the soil on site, rather than letting it be washed off into natural water bodies (e.g., streams, rivers, ponds, lakes, estuaries) prevents the degradation of aquatic habitats and siltation of harbor channels. Not letting soil wash off onto roads, which readily transport it into storm drains, prevents both hazardous driving conditions, and storm drains clogged with sediment. 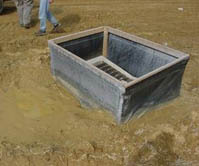 Silt fence is recognized as a Stormwater Best Management Practice (BMP) by the Environmental Protection Agency (EPA). 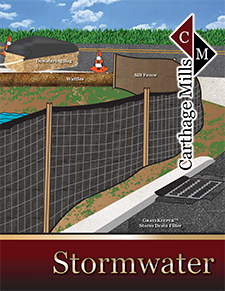 Carthage Mills’ offers a complete line of silt fence products from contractor grade to those that meet local, state DOT, and federal specs including AASHTO M 288-06. The cost of installing silt fences on watershed construction sites is considerably less than the costs associated with losing aquatic species, dredging navigation channels, and cleaning sediment out of municipal storm sewers. A single 100 foot run of silt fence has the potential to hold 50 tons of sediment in place. 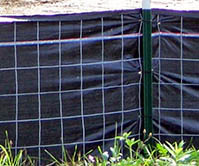 Carthage Mills’ silt fence is manufactured using UV-stabilized polypropylene yarns designed for effective silt retention while allowing maximum water flow and durability. 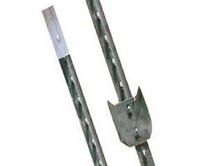 Easy to install and remove, silt fence is typically held up by either wooden or metal posts. 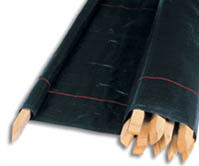 Carthage Mills’ silt fence offerings include fabric only, prefabricated fence with posts, and wire backed fabric that has been pre-attached for your convenience. 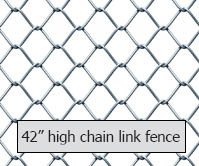 For site-assembled Super Silt Fence you will need our 42” chain link fencing and steel posts.